Today I’m sharing my little farmhouse kitchen decorated for fall and a fall-favorite recipe for Pumpkin Pudding. Last year, if you remember, I participated in the blog hop series organized by Kristen from Ella Claire Blog, which was a month-long series of blog posts in the Fall and Christmas seasons. This year we are back with the same group, doing the same thing! Each week we share one space in our home decorated for the season. We are starting with our kitchens, next week we will be sharing a tablescape in our dining rooms! 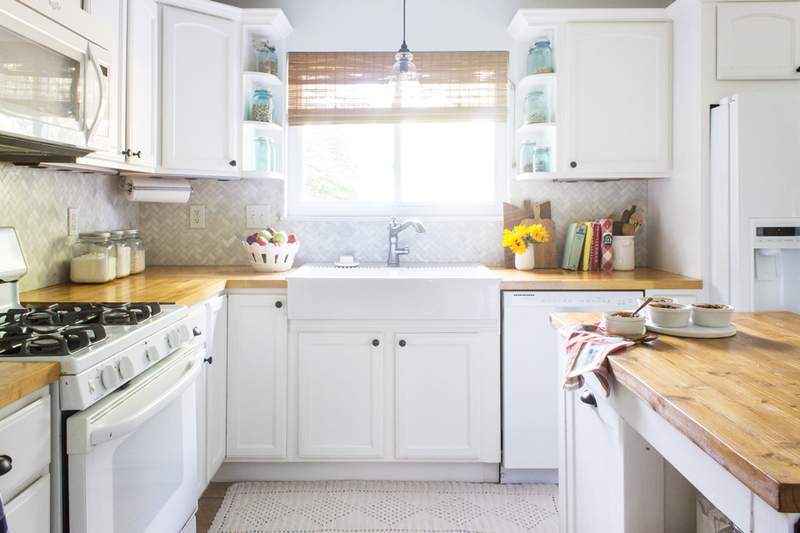 My kitchen is not the largest kitchen, and I often find it challenging to bring in seasonal changes that can last a couple months without cluttering up limited counter space. Sometimes the best nod to fall is freshly baked goods, seasonal fruit, and fresh flowers! This recipe is actually a fall-favorite of a friend of mine and was new to me. 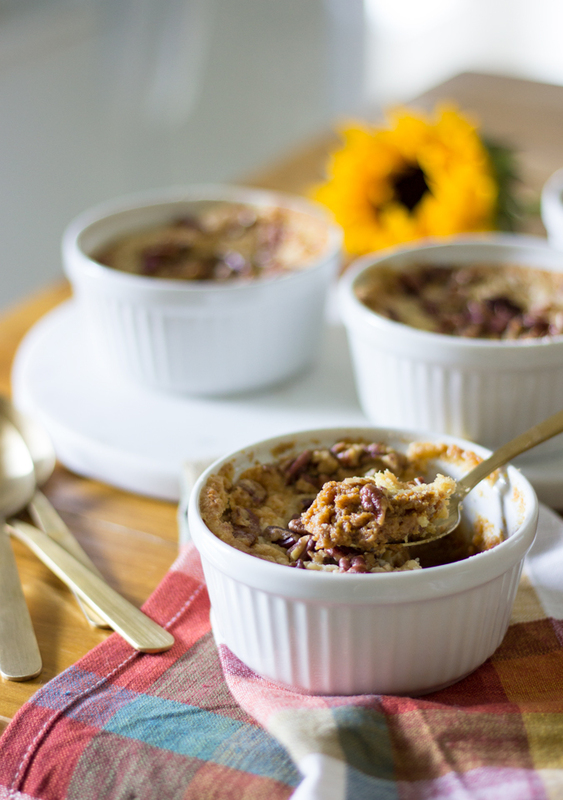 I made this Pumpkin Pudding for the first time this past weekend and it was so delicious and super simple to make! It’s like a mix between pumpkin pie and apple crisp. I decided to re-orient my kitchen island— which is a nice option to have when your kitchen island isn’t secured to the ground. I’m not sure it will stay this way, but it’s fun to try something new. I got lucky with this cute navy buffalo check apron and matching hot pad… I found at in the clearance section at HomeGoods. 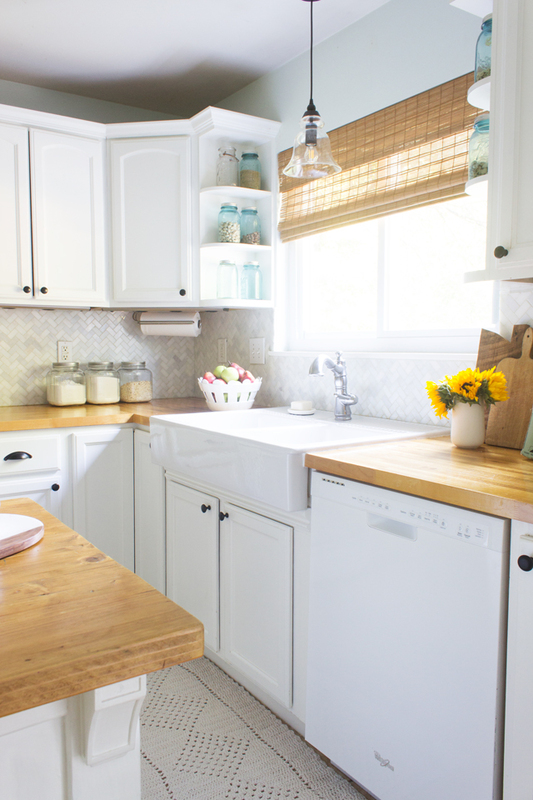 Here’s a little wider view of the kitchen sink area– I still love having all white appliances! 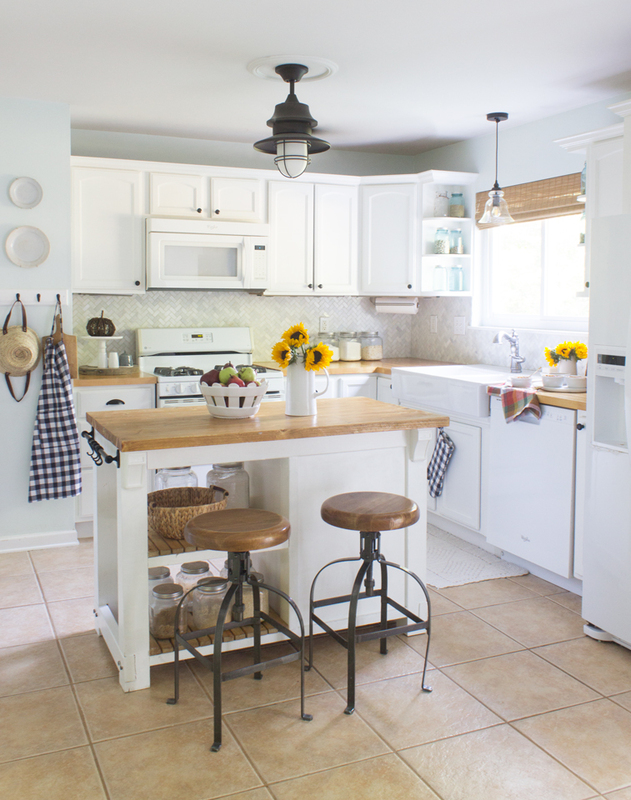 The continuity of white helps the small space feel larger. At the foot of the kitchen sink I put in a large crochet mat/rug that I bought in Sao Paulo, our last day in Brazil when we went to the Ceasa. It cost me about 80 reais, which is like $25. I have been surprised with how well it cleans up! It was filthy before I took these pics– I just threw it in the wash and it came out perfectly clean! I’ll admit that this island being oriented this way doesn’t photograph as well– the side with the shelves looks a little busy and dark, but it helped me get a little more excited about photographing a space that I’ve already taken pictures of multiple times a year. Mix the first 9 ingredients together with a whisk. 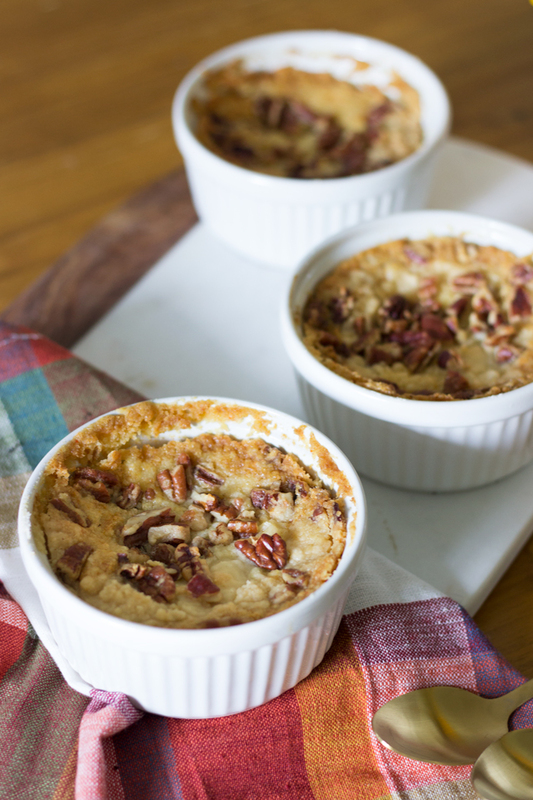 Pour into a 9x13 baking dish or 8 ramekins. Sprinkle yellow cake mix on top, spreading evenly. Pour melted butter over the top of the cake mix. 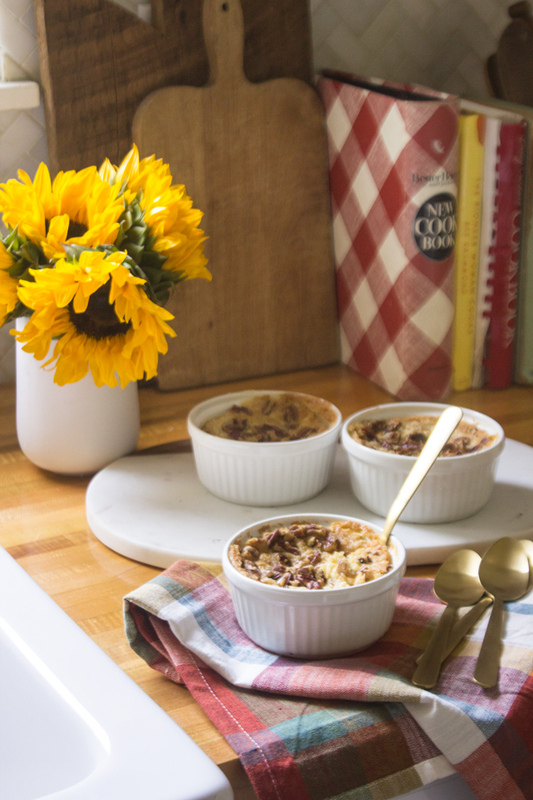 Sprinkle with pecan pieces and bake in 350 degree oven for 50 minutes for the 9x13 baking dish, or 35 minutes for the ramekins. Don’t forget to visit all these lovely posts sharing my friends’ kitchens and recipes! That pudding looks amazing! 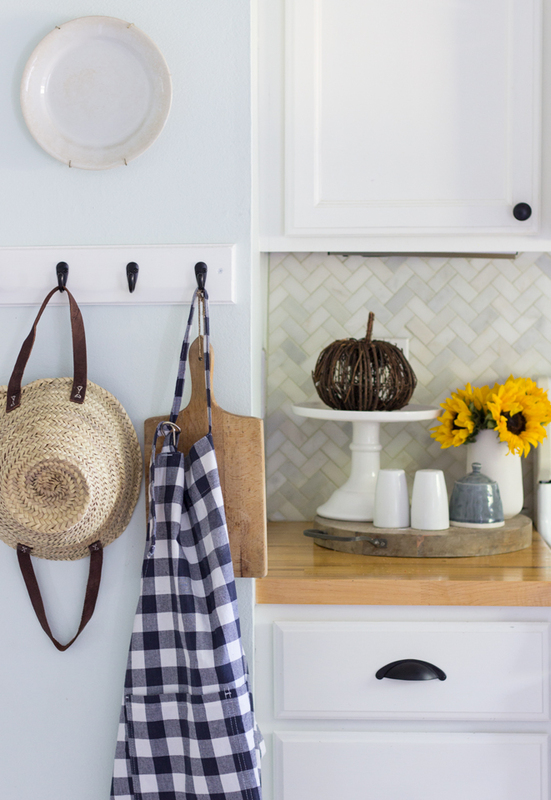 Your kitchen is so pretty ready for fall! You have such a bright and happy kitchen. Also, that pudding looks CRAZY good! Yum!! Your kitchen is lovely. Can’t wait to try the pudding. Looks delicious. So pretty Rachel! And that pumpkin pudding looks so amazing! ok your dessert looks so good! I’m coming over! Your kitchen looks very nice, and the few fall touches are just enough. Like me, your kitchen is on the smaller side and without very much counter space. I always have a problem with what to place on my counters for that very reason. I have an antique farm table that is small that I use for an island. By the way, can’t wait to try your Pumpkin Pudding, it looks and sounds great !! We love pumpkin anything so I can’t wait to try this! 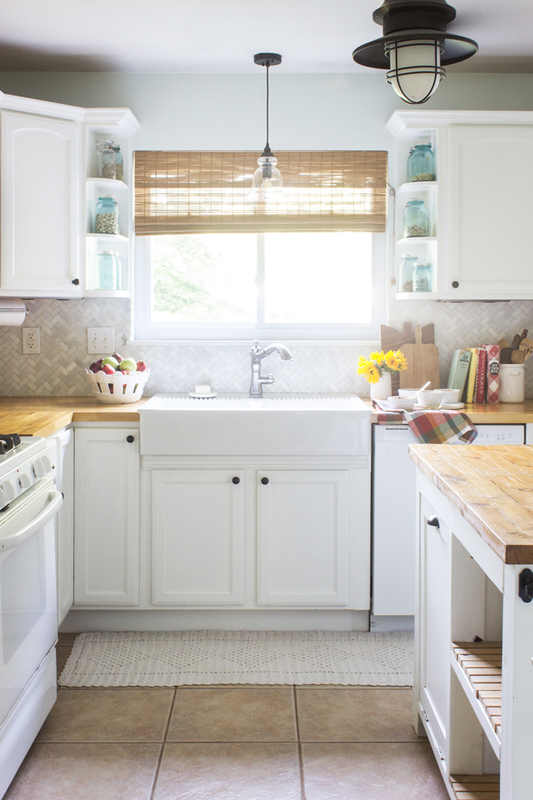 Your island looks great and I love how much light you get in your kitchen! Your kitchen is so warm and cozy, and this pudding looks delish! Thanks for sharing. The recipe for pumpkin pudding sounds easy and delicious. My family likes everything “pumpkin!” I will be making this. 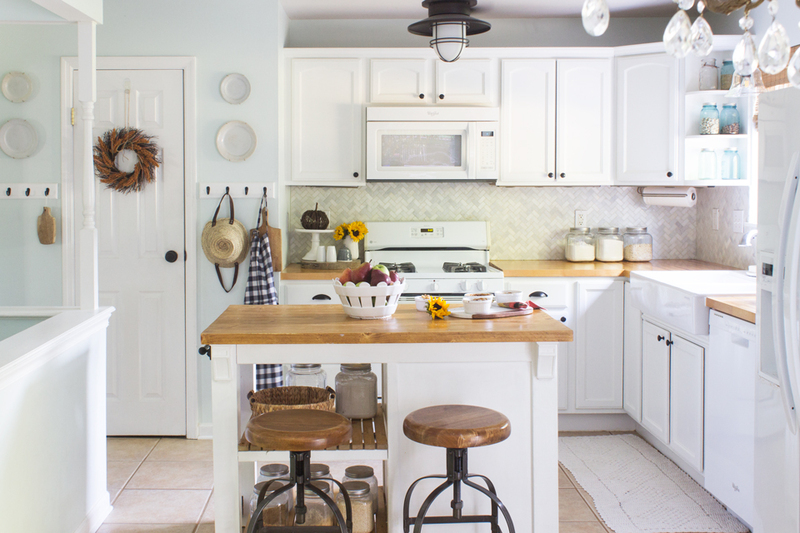 Your kitchen looks so bright and cheerful. I love the stools at the island and the black light fixture. The sunflowers add so much color also – one of my favorite flowers! The look and the ingredients in this pudding has my mouth watering. Can’t wait to make it. Thanks for sharing. LOVE all your white appliances too! Everything looks crisp, clean and bright! Lucky you! I make this pumpkin pudding, aka crust-less pumpkin pie, every fall. If you use sweetened condensed milk you do not even need to add any sugar. It is a favorite in our house! !